Did I mention that Kade has a lot of fieldtrips at the beginning of the year? He's already had his second one. 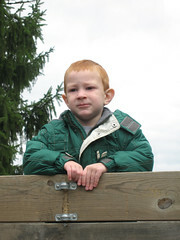 On Thursday we went to Bendix Woods for a hayride. I really had no desire to go. I've done it four times already. It's always cold, usually rains the night before or that morning,...I know, it's for Kade not me. So I sucked it up, took some Advil and a muscle relaxer, and off we went. 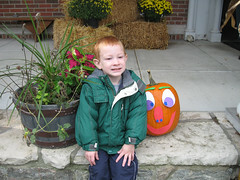 Kade's friend Noah and his mom, Amy, rode with us. That was nice to have someone to talk to. The boys were engrossed in a Backyardigans for the entire drive. The sun did peak out and warmed us up a little and only the ground was wet. 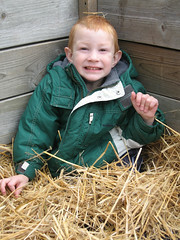 I told Kade we were going to a park for the hayride and there would be wagons of hay for us to ride in. He then asked, "How the horses going to get there?" I guess he was still stuck on our Shipshewana trip. I told him there wouldn't be any horses the wagons were pulled by a tractor. His face lit up. 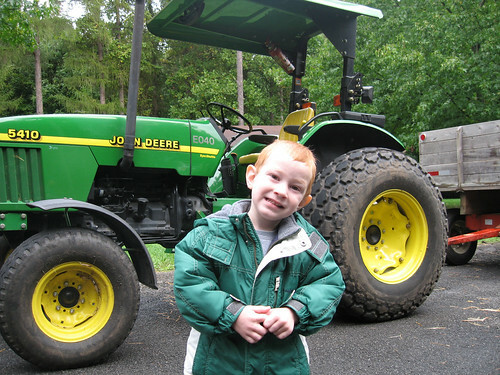 He had to get a picture with the tractor. Here's the other pictures I took. He's a little goofy in them. The trip did turn out to be fun for Kade and not too bad for me. I still can't seem to come home the same way I go. Maybe next year.